Linux containers (LXC) is a lightweight virtualization technology built into Linux kernel. Unlike other similar technologies, the virtual machines (VM) are driven without any overhead by the kernel already running on the computer. In VM you run only the processes you need, most of the time without even going through the regular SysV or Linux init. This means that memory is used very conservatively. These lightweight containers are sometimes called application containers, as opposed to distribution containers where you run a full distro starting with SysV/Linux init. In this article I’ll take a look at installing and building a small web server application container using LXC on a Debian 7 workstation. Debian is a popular distribution for personal use among software developers, and the amount of software packaged far exceeds any other Linux disto out there. It also encourages tinkering, experimenting, and in a more general sense, learning about Linux and Free/Open Source Software. The computer I am using is an old amd64 dual-core computer with a minimal LXDE desktop manager installed. For those of you interested, I have detailed the installation steps in my Lightweight Debian: LXDE Desktop From Scratch article. Since we are dealing with kernel utilities, all the commands in this article are specified as user root. This entry was posted in Linux, Virtualization and tagged Debian, LXC on August 10, 2013 by netblue30. For my memory comparison of light Linux desktops I needed a tool that would allow me to install on my computer about 20 window managers/desktop environments. After looking at several common virtualization packages, I ended up using Linux containers and virtenv for the job. Probably the best way to describe virtenv is as a graphic interface for Linux containers utilities developed and distributed by LXC project. Linux containers is the virtualization technology build into Linux kernel, available in any kernel after 2.6.32. The virtual machines (VM) are driven without any overhead by the kernel already running on the computer. You don’t need to run a different kernel in the virtual machine, run only the processes you need, without even going trough the regular SysV or Linux init. This all means that memory is used very conservatively. 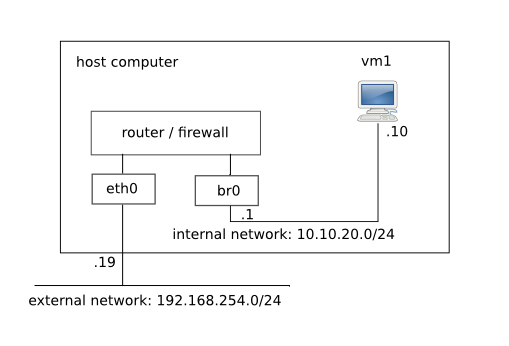 For example, on a 1GB RAM computer you can run easily 10 SSH/DHCP servers, or 10 different xorg/X11 servers with LXDE window managers on top. This entry was posted in Networking, Virtualization and tagged LXC on April 13, 2013 by netblue30.